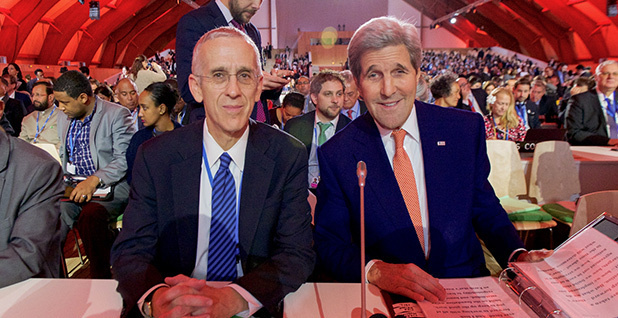 U.S. Special Envoy for Climate Change Todd Stern and Secretary of State John Kerry brought home a climate change accord from Paris. 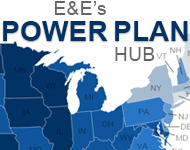 But will the Supreme Court’s ruling on the Clean Power Plan upend it? Photo courtesy of the U.S. State Department. The White House took a step away yesterday from the U.S. EPA rule it built its second-term climate agenda around, saying America could meet its Paris commitments even if the Supreme Court ultimately throws it out. In remarks the day after the high court unexpectedly stayed the Clean Power Plan -- delaying it for a year or longer -- White House principal deputy press secretary Eric Schultz told reporters aboard Air Force One that Obama's legacy rule is not the only way the United States could meet its commitments to the global climate deal. "There are driving forces that will allow the United States to meet its commitment outside of the Clean Power Plan rule," he said. Other policies, like the renewable energy tax credits that were extended late last year as part of a budget agreement with Capitol Hill, could help the United States achieve Obama's promise of cutting greenhouse gas emissions between 26 and 28 percent compared with 2005 levels by 2025, he said. And "ongoing, intense" discussions with U.S. negotiating partners confirmed they understood that. But from Africa to the Indian Ocean, diplomats who negotiated in Paris reacted to news of the stay with concern. While some expressed optimism that the United States will meet its 2025 commitment, others said the suspended rule throws U.S. leadership into serious doubt. "It is a most disconcerting development," said Thoriq Ibrahim, the Maldives' minister of environment and chairman of the Alliance of Small Island States. "It was our understanding in Paris that the U.S. contribution to the international effort required dramatically cutting emissions from its coal plants. This ruling calls that into question and could potentially undermine a carefully crafted agreement upon which the survival of many small islands could depend," Ibrahim said. "I would think all countries committed to the Paris Agreement, not just [small island states], will be concerned, and maybe even a little nervous, about this," said Ronald Jumeau, the Seychelles' ambassador to the United Nations. Climate-vulnerable countries like his own "fought down to the wire to have some of our major needs, such as the 1.5 C temperature target, loss and damage, and the special vulnerability of small island developing states, among others, included in the agreement," he said. "We've come too far to lose these," he said. Gambia's environment minister, Pa Ousman Jarju, called the Supreme Court ruling "a big setback for the climate change agreement." Jarju, who previously led a group of the world's poorest nations in the climate talks, noted that the United States' insistence that it could meet its goals was central to its negotiation position. "The Paris Agreement was signed based on the U.S. ability to implement it based on the Clean Power Plan. The Obama administration should do everything feasible to the U.S. implement[ing] its obligation under the Paris Agreement," he said. Indian negotiators during the talks demanded assurances that the United States would follow through on its own pledges -- especially since the world's largest historic emitter demanded, successfully, that major developing emitters to take more responsibility for reductions. Jairam Ramesh, India's former environment minister, said he was disappointed to hear of the Supreme Court's decision. In an email to ClimateWire, he said the court's decision "raises fresh doubt" about the United States' ability to make good on its Paris pledges. "The judgement not only strengthens the hands of the climate change skeptics and climate change deniers at home but also provides ammunition to those in countries like India who continue to think that India has committed far too much already given its historical responsibility (and per capita emission levels)," he said. "If the US does not show leadership, countries like China and India are themselves most unlikely to be aggressive in moving to a low carbon growth path." European leaders, meanwhile, remained publicly optimistic about the United States' ability to reach its goals with or without the Clean Power Plan. Behind the scenes, though, they said they are expecting answers from their American counterparts about what the way forward looks like. The Obama administration officials have repeatedly told the international community that the Clean Power Plan is "legally bulletproof," one diplomat said. U.S. Special Envoy for Climate Change Todd Stern is expected in Brussels next week for a trip that just a day ago would have been somewhat of a victory tour. "We have confidence in all countries to deliver on what they promised. The EU will continue to lead by example and enshrine its targets into law. I will meet the US climate envoy Todd Stern next week in Brussels and hope to better understand the potential implications of the Supreme Court's decision," European Climate Action and Energy Commissioner Miguel Arias Cañete told ClimateWire in a statement. An official from New Zealand, a U.S. ally in the climate talks, also took the news in stride. "The CPP was never going to be plain sailing -- it was clear right from the get-go there would be litigation, for example," said New Zealand Ambassador Jo Tyndall, the country's lead climate negotiator. She argued that the Supreme Court's decision is more procedural than substantive and is only a temporary freeze that leaves plenty of time for the Clean Power Plan to still be implemented. "In my view, it's a bit too early to say how the international community will react, though uncertainty always produces some jitters," Tyndall said via email. "People will undoubtedly be watching closely to see how the administration acts -- and reacts -- looking for reassurance that targets, timeframes and intention to join the Paris Agreement are still on track." The State Department yesterday said Stern's Brussels trip was planned before the stay was issued. While Stern will discuss the stay with the Europeans, it will not be the only item on the agenda, an aide said. The White House's willingness yesterday to entertain a future where the Clean Power Plan might not be in effect and driving reductions was a marked departure from the administration's message while the Paris talks were happening. The utility-sector rule was the administration's main showpiece in Paris. EPA Administrator Gina McCarthy spent days making the rounds at the U.S. center and in private meetings with foreign delegations at the conference extolling its effectiveness at cutting emissions and its likelihood of remaining in effect. She told ClimateWire in an interview during the second week of the talks that she was asked about the Clean Power Plan more often than about anything else. "We have had a steady stream of countries coming in asking to understand it: Is it going to last? What are all these lawsuits; what is Congress doing?" she said. "We've been trying to let people know not just how serious it is but how important it is that this last," she said. "And, in fact, it will." Tuesday's move by the Supreme Court doesn't ensure that the rule won't last. In fact, the five Republican justices provided few clues about why they chose to stay the rule, leaving others to speculate about what its fate might be when it reaches the high court. But EPA foes on Capitol Hill and in industry were quick to say, "I told you so." Sen. John Barrasso, the Wyoming Republican who chairs a key Senate Foreign Relations subcommittee, said other countries should be on notice that Congress is not behind the president's pledges -- especially since they will not be submitted for Senate consent. "I would tell people from all around the world, 'Do not rely on President Obama's commitments to be kept to them,'" he told ClimateWire. "And I will do everything I can do to make sure that the president's promises cannot be fulfilled." Stephen Eule, vice president for climate and technology at the U.S. Chamber of Commerce's Institute for 21st Century Energy, said that even when the Clean Power Plan was moving ahead as planned, a gap existed between the administration's policies and the emissions reductions it has promised by 2025. Using figures included in a Dec. 31 submission to the United Nations, he projected that current policies would lead to a 15 percent reduction by that year -- just over half what was pledged (ClimateWire, Jan. 29). Without the Clean Power Plan, he said, the United States would fall short of its commitments by 60 percent or more. "The gap will become a chasm," Eule said. But the administration has said the Paris commitments will indeed require more work than it can do its final year in office -- and other U.S. analysts and advocates agree. The Clean Power Plan helps the United States meet its Paris goals, and its loss would be a blow, they say. But even with the marquee rule alive and well, more will have to be done by federal and non-federal governments and the private sector if the United States is to deliver on its Paris targets. Without the rule, there would still be policies and market trends that could be effective in driving reductions, several experts said. John Larsen, an analyst with Rhodium Group who recently co-authored a report on the topic, said the production and investment tax credits for wind and solar that Congress extended late last year would do more to help the United States hit its 2020 targets than the EPA rule would. The Clean Power Plan doesn't come online until 2022 -- three years before the United States' Paris commitment comes due. And even post-2020, the rule will need help. Its 32 percent in utility-sector reductions by 2030 couldn't bring the sector's emissions low enough to put the Paris pledge in reach unless technology and economic drivers conspire to make cheap renewable energy widely deployable. Nigel Purvis, a senior U.S. climate negotiator in the Clinton administration and now the president of consulting group Climate Advisers, said other countries should pay more attention to whether the United States meets its carbon targets than to how it gets there. "What matters is action," he said. The Supreme Court ruling is "an unwelcome development," Purvis allowed, but he cautioned against knee-jerk assumptions that the United States won't meet its Paris goals. "Don't look at the sausage-making," he said. "Wait for the meal." Jake Schmidt, international program director for the Natural Resources Defense Council, acknowledged that the stay "raises questions for other countries" -- particularly since many in the global climate community remember that the United States failed to ratify the 1997 Kyoto Protocol, which it took a lead role in negotiating. That doubt "lingers over their head" now as they eye the stay. But he said those countries could take comfort that many policy and market trends are driving reductions in the United States. "Those trends don't just disappear because the Supreme Court decides one way or the other," he said. Elliot Diringer of the Center for Climate and Energy Solutions said other countries will certainly follow the legal challenges to the power rule with great interest. But they will reserve judgement. "If it appears that the U.S. is falling off track, they'll want to know what the alternative pathways will be," he said. But those who gathered in Paris two months ago were already keenly aware of the political and legal conditions in the United States -- including that this is Obama's last year in office. "This may underscore uncertainties, but those uncertainties were well-known already," he said. Paul Bledsoe, a former Clinton White House climate official, said the conservative justice's action should "remind foreign audiences of the profound U.S. political divide on climate, and in particular that a Republican president would broadly undermine many climate efforts that Obama has put in place." "Key foreign leaders should speak out and make clear how important they see the climate stakes of the U.S. election," he said. Reporters Camille von Kaenel and Pola Lem contributed.